It’s been a beautiful weekend here in Kendal – a little on the chilly side, but one of those wonderful cool, crisp and clear weekends with hardly a cloud in the sky. 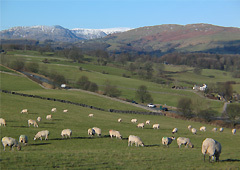 On Saturday we went for a stroll on Helsfell Nab on the outskirts of Kendal. The views were as clear as ever; as you can see from the picture, there’s still snow on some the nearby fell tops and that’s likely to stay around for a while as we’re forecast some more snow on Monday. There’s an interesting article in today’s Telegraph entitled “Hotels go bust as Britons opt to self-cater“, claiming that many hotels are closing at the expense of both self-catering and camping holidays. Apparently 47 hotels ceased trading in Britain in the last quarter of 2009 and there are suggestions in the article that the rate of insolvencies could increase further in 2010. Meanwhile, research by BDRC Continental indicates that the ‘Back to Britain’ trend which characterised 2009 looks as though it will go from strength to strength in 2010 and that 25% of those who intend to take a UK holiday this year are likely to opt for self-catering accommodation. New visitor signs are springing up around town thanks to The Kendal Signage Project which has seen Cumbria County Council, South Lakeland District Council, Kendal Town Council and others join forces. In total 17 new signs are going up across the town. This process started in September 2009 with a sign in Wainwright’s Yard and will continue until the Spring of 2010. As well as depicting historical information, the signs feature maps of Kendal that are designed to improve transport links by highlighting the likes of the town’s business station and Oxenholme railway station. First things first… a warm welcome to the Kendal Cottages blog! We are pleased to announce that today we exchanged contracts on our first property and so we can now finally give a little more information on what we shall be offering. It’s a two-bedroomed luxury riverside apartment with a wonderful view over one of Kendal’s historic bridges (Stramongate Bridge) towards Kendal Castle beyond (where Catherine Parr, Henry VIII’s sixth wife, once lived). 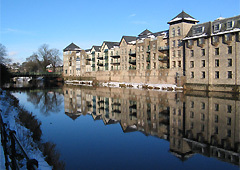 It can be found in Kentgate Place (pictured), a new development on the banks of the River Kent that is within easy walking distance of Kendal’s many amenities. For those who are not familiar, Kendal is a beautiful market town situated between the Lake District and Yorkshire Dales National Parks. The apartment is finished to a high standard with Sheraton quality kitchens with granite worktops, Villeroy and Boch bathroom pottery and tiling, Laura Ashley sofas and solid oak furniture (on order! ), and will be equipped with a 42″ Panasonic flat-screen TV and Bose sound system in the main living area, as well as flat-screen TVs in both bedrooms. We’ll use this blog to report on our progress as we get the property ready for an Easter opening, as well give news on other items that might be of interest to prospective guests. And, of course, we hope to welcome you soon!